In this competition which takes place annually during the Eugene Celebration weekend, local architects and landscape architects present their featured projects in various categories, and the citizens of Eugene cast their vote for the best project in each category. 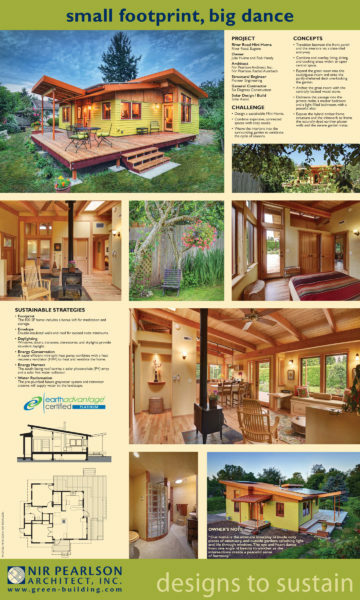 • Design a sustainable Mini-Home. • Combine expansive, connected spaces with cozy nooks. • Weave the interiors into the surrounding garden to celebrate the cycle of seasons. • Transition between the front porch and the interiors via a slate-tiled entryway. • Combine and overlap living, dining, and cooking areas within an open central space. • Expand the great room into the study/guest room and onto the partly-sheltered deck overlooking the garden. • Anchor the great room with the centrally located wood stove. • Delineate the passage into the private realm, a master bedroom and a light-fi lled bathroom, with a peaceful altar. • Expose the hybrid timber-frame structure and the trimwork to frame the naturally-dyed earthen plaster walls and the serene garden vistas. Footprint: The 800 SF home includes a bonus loft for meditation and storage. Envelope: Double-insulated walls and roof far exceed code minimums. Daylighting: Windows, doors, transoms, clerestories, and skylights provide abundant daylight. Energy Conservation: A super-efficient mini-split heat pump combines with a heat recovery ventilator (HRV) to heat and ventilate the home. Energy Harvest: The south-facing roof carries a solar photovoltaic (PV) array and a solar hot water collector. Water Reclamation: The pre-plumbed future graywater system and rainwater cisterns will supply water to the landscape. Posted in Awards, Regional, Residential.